The standout reports from the last two weeks are mostly real estate related. The Housing Market Index kicked things off two Mondays ago with a solid reading of 58 (this is a sentiment index with 50 as the dividing line between positive and negative). Homebuilders are not gaga with optimism but this number has been fairly consistent recently. Housing starts were then reported higher and higher than expected, up 6.6% from the March pace. One is less impressed with the number when looking at the year over year decline of 1.7%. Existing home sales were also up month to month and year over year. That’s nice but doesn’t have the impact on GDP that new building does. If the new home sales numbers – 619K annual rate, way above expectations with prices up nearly 10% – are to be believed and are sustainable then the economy may be doing better than we think. However – and you knew there was a however didn’t you? – I think one has to wonder first if this very volatile series is anywhere near reality and also what the impact of expected rate hikes is on sales. I can’t help but think that buyers might be rushing to get deals done before the Fed decides to do more than just talk about rate hikes. So, while acknowledging that it is a good number, I think I’ll wait for a little more evidence before calling the boom. There was other data released too but little of it unexpected. The regional Fed surveys – Philly, KC, Richmond and Empire State all reported in the last two weeks – all fell back into negative territory, last months rebound an apparent mirage. Oil prices may have recovered but manufacturing activity hasn’t. The Chicago Fed National Activity Index poked back into positive territory but basically says the economy is growing at trend – which is not a particularly inspiring sign these days. We did see a rebound in Durable Goods orders but the ex-transportation number was meh and capital goods orders were down a third straight month and five of the last six; business investment is no where. The bond market reflects the tepid data. 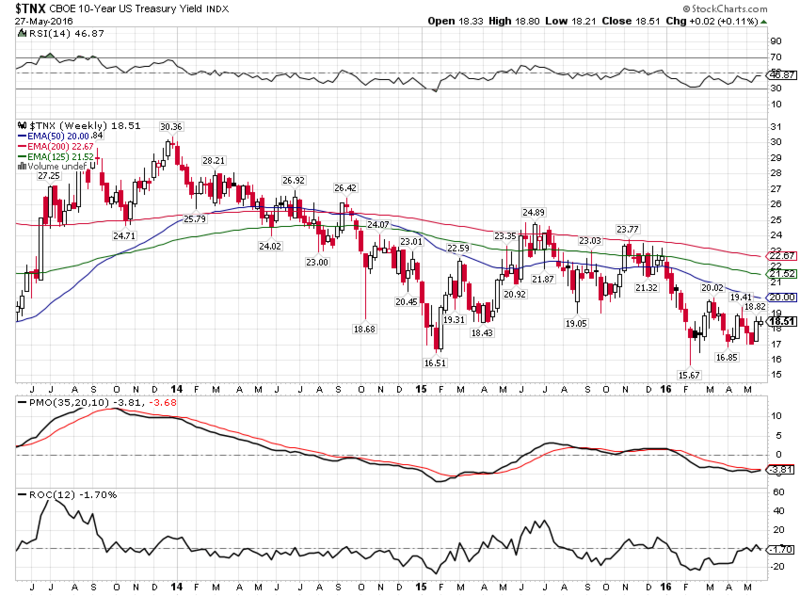 While the 10 year yield did tick up sightly since the last update, the trend is still down. 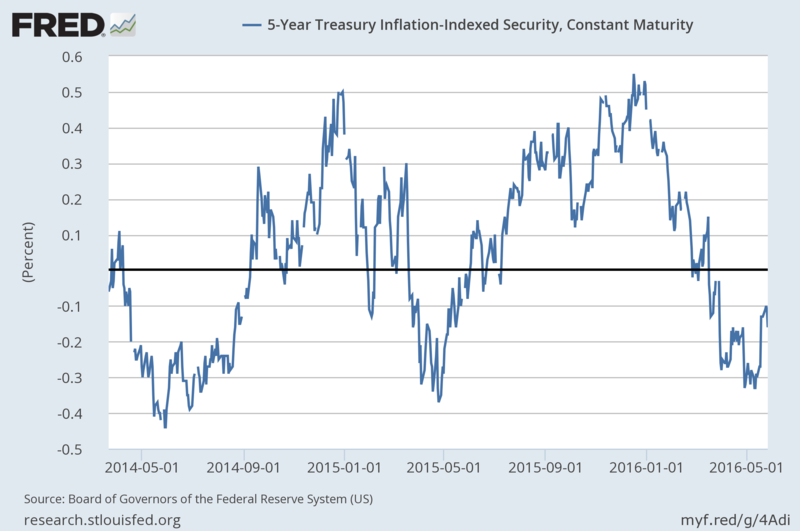 Real rates also moved a little higher but the 5 year TIPS yield is still negative. 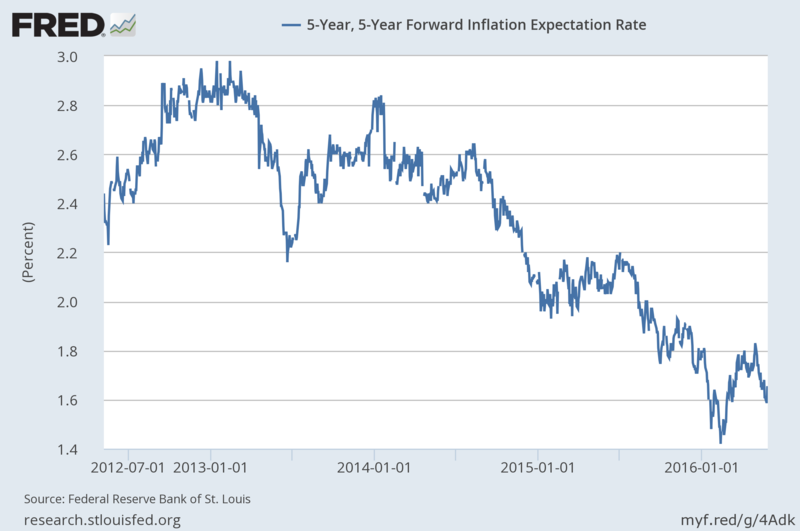 Inflation expectations are little changed since the last update but the trend is obvious and still favorable to bond holders. 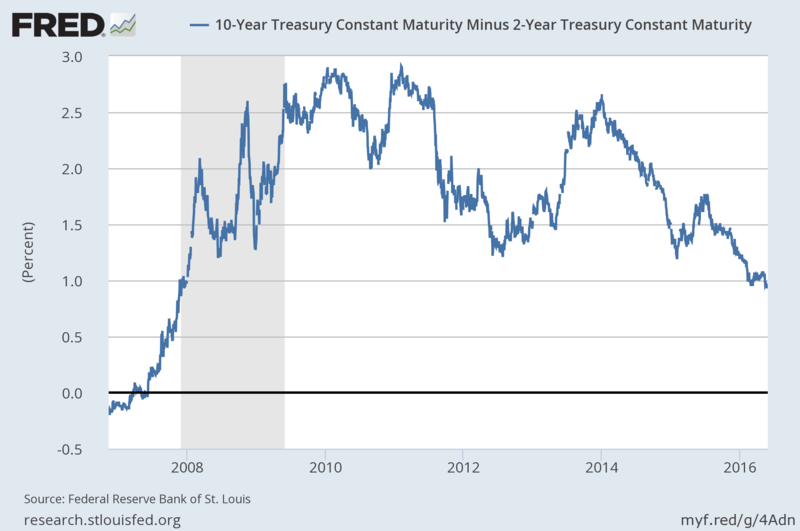 The yield curve was absolutely unchanged since the last update and again the trend is obvious. 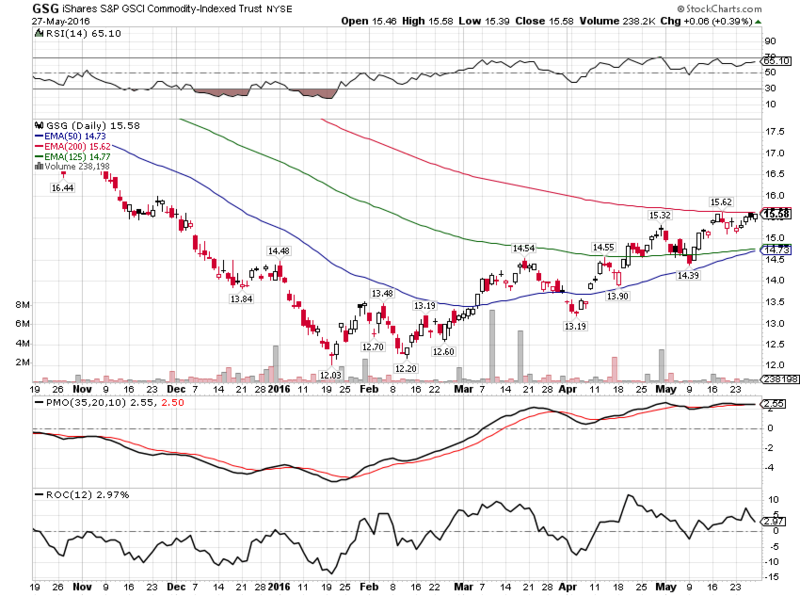 The curve is flattening but no where near flat or inverted yet. And, as I’ve said many times the last couple of years, I have no idea if it will get there before the next recession. 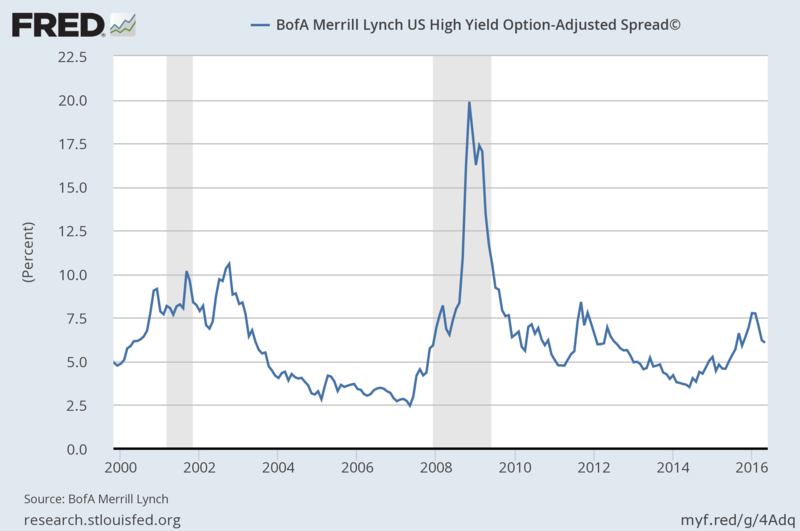 Credit spreads continued their recent narrowing but the overall trend is still intact and toward wider. 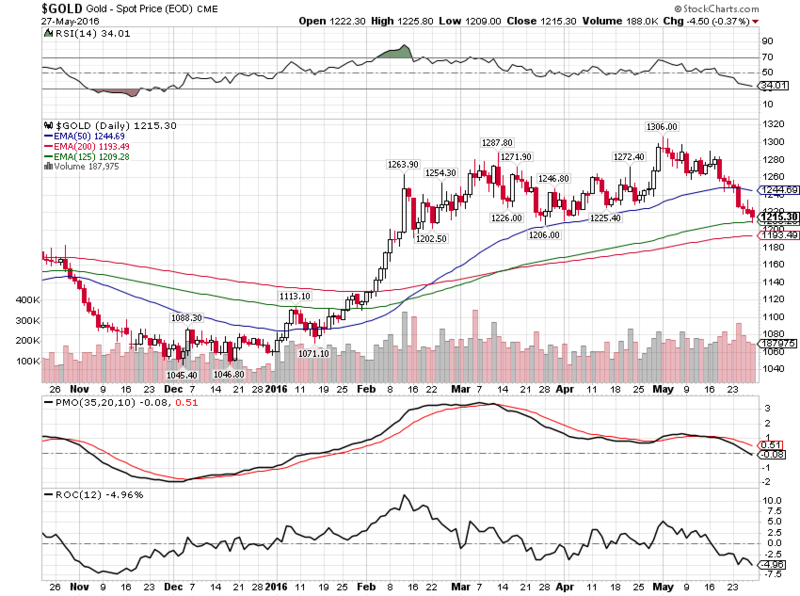 It will not take much more narrowing though before I will have to take some action with our portfolios. 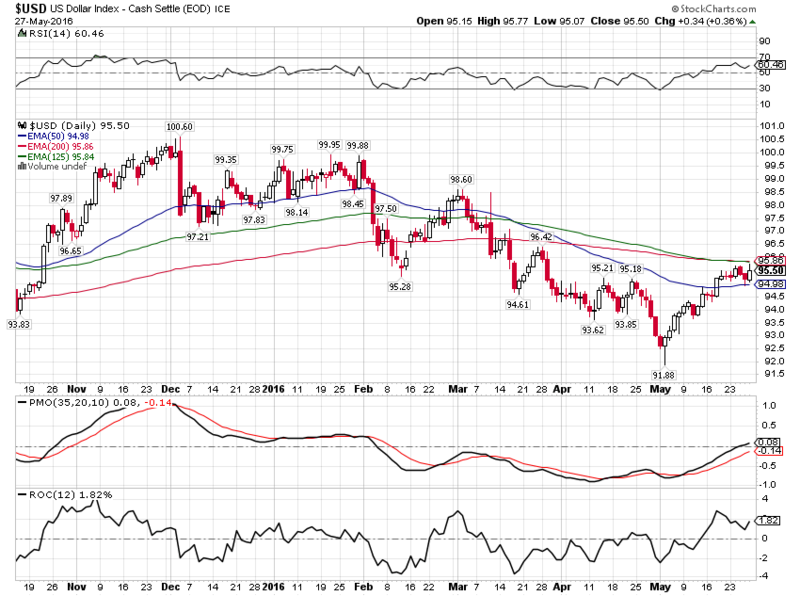 One plus for the optimists is the continued rally of the dollar over the last two weeks. Of course, most of this rally is about expectations for Fed rate hikes which are driven by the Fed’s own rhetoric and economic outlook. One wonders where the dollar would be if the Fed would just shut up for a couple of weeks…but there seems little danger of that. Even more interesting and also in the plus side of the ledger – for now – is that the more general commodity index was not affected by the rally in the dollar. The Fed is counting on the expected Q2 rebound in economic growth to allow them to hike rates in June or July. So far, the data is not that inspiring but there are some indications the market is starting to price in a minor improvement in real growth. I have my doubts that any rebound would last any longer than the last two 2nd quarter blips. This economy is growing at 2% and I’ve said for what seems forever that it isn’t likely to change without a major change in economic policy. And I don’t mean monetary policy which at best has been irrelevant and at worst has sown the seeds of the next crisis. As for the prospects of policy change I’ll have something on that soon and it might prove surprising. For information on Alhambra Investment Partners’ money management services and global portfolio approach to capital preservation, Joe Calhoun can be reached at: jyc3@alhambrapartners.com or 786-249-3773. You can also book an appointment using our contact form. This material has been distributed for informational purposes only. It is the opinion of the author and should not be considered as investment advice or a recommendation of any particular security, strategy, or investment product. Investments involve risk and you can lose money. Past investing and economic performance is not indicative of future performance.  Alhambra Investment Partners, LLC expressly disclaims all liability in respect to actions taken based on all of the information in this writing. If an investor does not understand the risks associated with certain securities, he/she should seek the advice of an independent adviser.